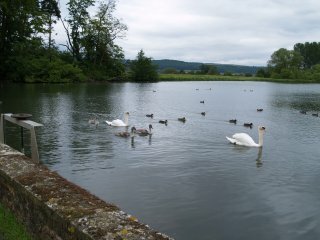 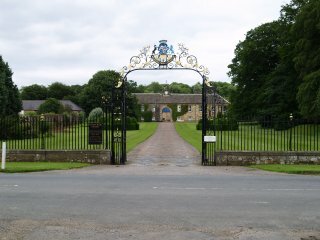 Left: Many houses, after rebuilding, displayed the crest, monogram and date of the Lord of the Manor, at that time, Sir George Wombwell. 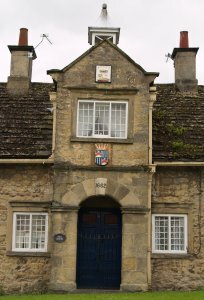 Centre: Details of the entrance to the Almshouses. 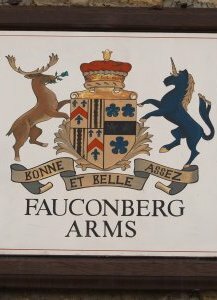 Right: The sign of the 'pub' The Fauconberg Arms (see picture below). 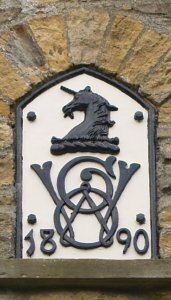 The 17th century Fauconberg Arms, before or after the walk around Coxwold or surrounding countryside! 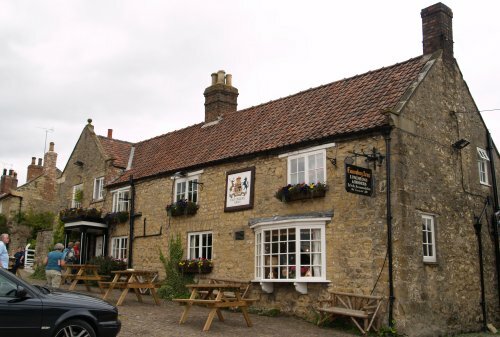 The inn takes its name from one of the Belasyse (Belasis/Bellasis)-Fauconberg-Wombwell family who held the estate of Newburgh Priory and were Lords of the Manor. 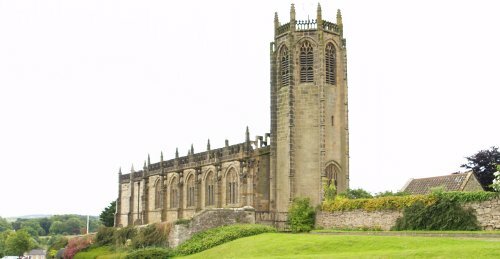 The fine early 15th century medieval Church of St Michael, Coxwold, built in the 1420's and 1430's with its unusual octagonal tower (detailed annotated pictures on page 27). 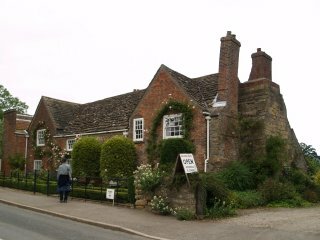 Shandy Hall (15th-17th century), where the distinguished 18th century writer-novelist Laurence Stern (1713-1768), author of "The Life and Opinions of Tristram Shandy", lived as the vicar of Coxwold. 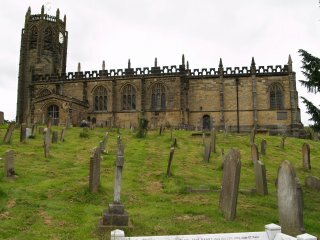 The fine early 17th century building of the 'Old Grammar School' dating from 1603 is just opposite St Michaels Church. 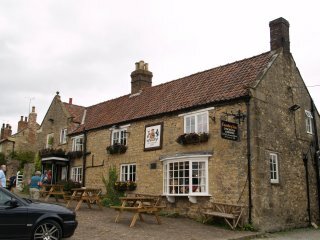 The charming, and, after a good walk, the most welcome building of Coxwold Tearooms! 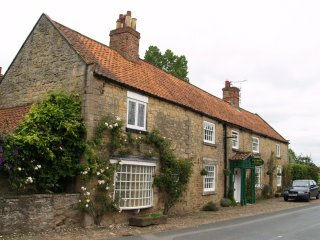 Coxwold Village, North Yorkshire, England, Just up the road from the 17th century Fauconberg Arms in the pretty village of Coxwold in North Yorkshire, England, is the splendid early 15th century medieval church of St Michael's with its unusual octagonal tower and Shandy Hall (15th-17th century), where Laurence Stern (1713-1768), author of "The Life and Opinions of Tristram Shandy" lived. 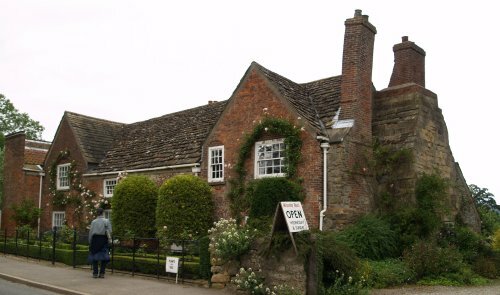 The Coxwold Tearooms offer an alternative source of refreshment on the road out of Coxwold that leads up to the entrance to Newburgh Priory, a Tudor manor house (15th-16th century) built from the original medieval Augustinian Priory buildings (founded 1145) and the lake by the roadside below the priory entrance. 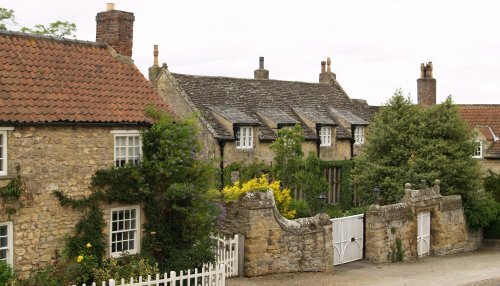 Both the priory and the buildings of Coxwold are major tourist attractions.